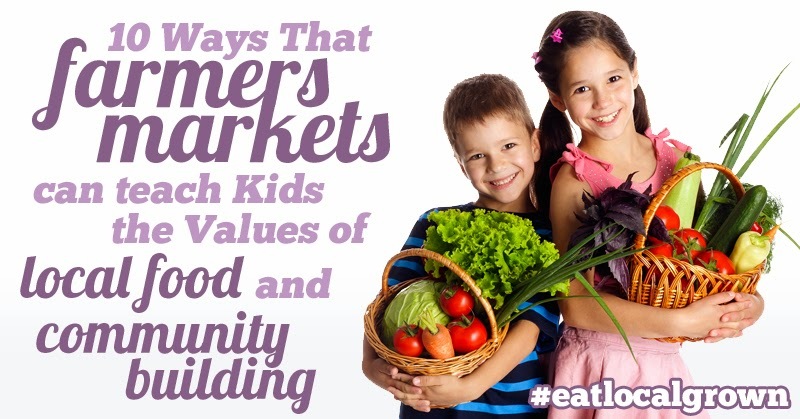 The Farmers Market is a great place to bring your kids for so many reasons! The Farmers Market allows you to provide your family with wholesome, healthy food while supporting your local community at the same time. Here's the reality- Family farmers need your support! Now that large agribusiness dominates food production in the U.S., small family farms have a hard time competing in the food marketplace. Buying directly from farmers gives them a better return for their produce and gives them a fighting chance in today’s globalized economy. One of the biggest myths about emotional eating is that it's prompted by negative feelings. Yes, people oftenturn to food when they're stressed out, lonely, sad, anxious, or bored. But emotional eating can be linked to positive feelings too! It's no accident that McDonald's named their kids deal a "Happy Meal"! They do this to form a lifelong emotional bond between being happy and eating at McD's, and it works! You can beat the fast food marketing guru's at their own game. Simply swap out the fast food and replace it with a fun day at the Farmers Market! Do this on a regular basis and your kids will start to equate healthy real food with those happy family days at the market. 2. Connect kids with "real food"
There is a huge disconnect between most Americans and their food. For the most part, we've stopped questioning where our food comes from, how it is raised and if it is good for our health. To a large extent, this is why our supermarkets shelves are lined with so many boxes of processed junk. And most of it isGenetically Modified (GMOs). We are the ones buying it so they keep making it! We can break that cycle with our kids and the Farmers Market provides a great opportunity to further the food connection discussion. It's much more effective when you practice what you preach. Buying from local sustainable farmers reinforces the message. As you know, kids are naturally curious. This is a good match because farming is really amazing. Think about it: plant seeds in dirt, add water, get vegetables! Of course there's a lot more to it than that. As we mentioned above, a lot of the farmers we meet are very proud of the work they do and they're very happy to talk about it. With a little coaching (if necessary) you're kids can ask some great questions, like- Why are you a farmer? What's your favorite things to grow? What's that hardest thing to grow? The easiest? Do you use chemicals or pesticides? Why, or why not? A cool side-effect of this is that the next time you go to the market your kids will remember the farmers. It's great to make new friends, especially when their doing something as important as growing your food. And let's be honest, if we really want to teach our kids about the value of real food, they should know how to shop for it! PS- If you have young kids, instead of actually shopping maybe you can just let them give the money to farmer. Little kids (and the farmer) will probably enjoy this! Getting kids involved in cooking is great. Basic cooking skills open so many choices for them later in life and alleviate them of the need to buy ready made, highly processed meals. But it's not always easy. Cooking the food you just bought, or the food THEY just bought if you followed the step above, makes this a whole lot easier. It's the next logical step- "We bought these veggies from the nice farmer, now we get to cook them!" For snack ideas, check this out: Quick Clean Eating: 40 Non-Processed Snacks for Busy Moms! Face it, some kids are just picky eaters. The 3 steps above may have a profound effect on their willingness to even TRY something new, right? Let's go through this- We met the farmer, learned about how they grew this, we bought it, we took it home and now we cooked it. It's just natural to want to taste it! For older kids, the Farmers Market provides an opportunity to learn about nutrition and why real foods are so important to maintain a healthy body. If your kids compete in sports, you can teach them why nutrients will make them better athletes. Even if they don't play sports they can understand that real food is packed with vitamins and minerals that make them stronger, smarter and healthier. Additionally you'll be able to choose non-GMO foods and support non-GMO farmers. TV screens, computer screens, iPad screens, phone screens- ARghhhh! Yes, I know you are reading this on a screen (unless somebody printed it for you). Screens are awesome but they have their time and place. Food has a huge impact on childhood obesity but at the same time most kids are on their butts too many hours per day. Do we really have to watch Lion King one more time? The Farmers Market is a great excuse to bust away from the TV, or Xbox or Facebook, Instagram, - whatever, and get some fresh air. A trip to the Farmers Market provides a great way to spend time together as a family. It's easy to enjoy each others company when you're doing something healthy. With little kids you can play fun games like finding food that's different colors or shapes. With older kids try a scavenger hunt and offer a family prize if the goal is hit.